Reddit took an interesting approach to dealing with trolls on its platform when it edited posts in “the_donald,” a highly active “subreddit” for supporters of the president-elect. In an “attempt to troll the trolls”, CEO Steve Huffman replaced mentions of his name with the names of the leaders of the pro-Trump forum, essentially re-directing vitriol he received to target those leaders instead. While some users found the action funny, many slammed Huffman for interfering in users’ conversations. Huffman has apologised for the editing, but the social platform maintains that it will not tolerate toxic discourse and is taking action – from warnings, to timeouts, to permanent bans – against hundreds of users and removing the thread from “r/all”, a popular listing that functions somewhat like a homepage. Social media platforms have long struggled to find a balance between allowing free speech and ensuring abuse does not deter users, but the role of fake news and trolling in the recent election (as discussed in a recent Friday 5) has brought into the limelight questions around how much room there is for a brand to moderate content. Now it seems more up brands than courts to decide what constitutes free speech and what constitutes hate speech, and brands from Twitter to Facebook to Reddit are all handling this responsibility in different ways. None of them have gotten it quite right yet, but we’ll keep you updated when they do. Lidl has launched a Twitter-based initiative that gives consumers collective control over the prices of select Christmas products. The ‘Social Price Drop’ enables customers to potentially lower the price of a featured product by tweeting about it during a designated two-day period. The more customers tweet about the product, the lower its final price will be. Every Wednesday in the run-up to Christmas the final prices of featured items will be revealed, with shoppers then able to take advantage of the reduced cost in-store the following Saturday. This is an interesting experiment in crowdsourcing prices that gets the brand talked about on social media by its customers around an attribute it is well known for (low prices). The benefits of word-of-mouth marketing have traditionally been reaped by luxury consumer brands so it’s great to see a mass-retailer successfully adapt the approach to suit its needs. Originally within the purview of NGOs and charities alone, this year saw a major increase in corporate activity around Giving Tuesday, the national charity push-back to the consumerist Black Friday and Cyber Monday that encourages the public to donate to their favourite charity or to a good cause. British Gas donated £1 to their charity partner Shelter for every unique use of the hashtag #TweetForShelter and BT – an official GivingTuesday partner – encouraged consumers to ‘do good stuff’ and hosted a #givingtuesday Power Hour at the BT Tower. While corporate engagement needs to be strategic and thoughtful, there is always a role for philanthropy and giving and the day is a great way for a company to use a money-driven greedy holiday as an opportunity to show what they care about and to bring their purpose to life. Probably no brand did this better than Patagonia, which beat everyone else to the giving by donating its entire $10m takings from Black Friday to environmental organisations. Of course, giving needn’t be limited to one day a year, and if you’re looking for a worthy cause to support, we would point you in the direction of the world's first professional ensemble for disabled musicians, which is currently gearing up for a three-date ‘Celebration of Bowie’ tour taking place this December. TED has launched a new mailing list that will deliver a good idea to your inbox every day in December. Think of “31 days of ideas” as an advent calendar of ideas that seeks to show that, despite what happened in 2016, the world still is a wonderful place. The first idea worth spreading—“maybe I’m wrong”—was chosen by FT economist Tim Harford who introduces Kathryn Schulz’s talk, "On being wrong", and explains that we now seem to be proved wrong more often than we used to, and the root cause of the problem is the powerful illusion of our own rightness. While we hope Friday 5 remains your favourite mailing list(! ), we think this is a lovely way to round out the year. Make sure that you don’t miss out on your daily idea by subscribing here. An independent scientific body tracking progress against the Paris Agreement has released a report outlining ten short-term actions that are necessary if we are going to hold the increase in the global average temperature to well below 2°C. Climate Action Tracker puts our current increase at 3.6°C and warns that efforts will have to begin by 2020 and accelerate by 2025 to reach zero carbon dioxide emissions by mid-century, and zero greenhouse gas emissions overall in the 2060s. 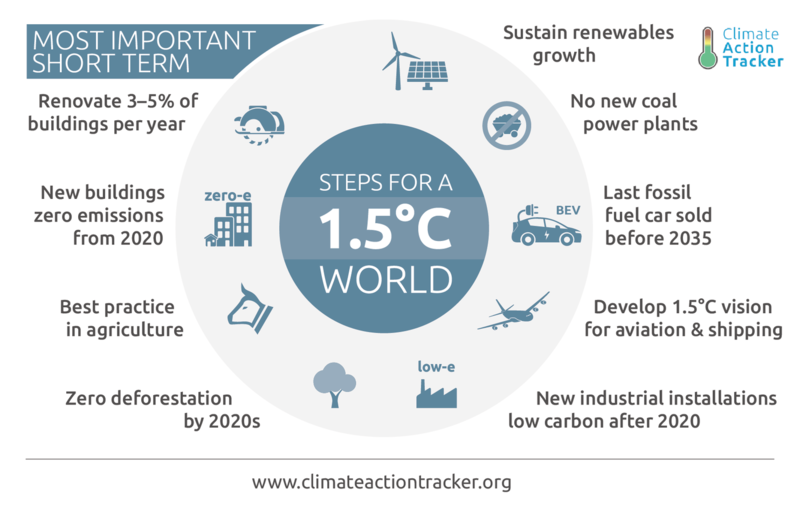 The ten suggested actions (summarised in this infographic) are each assigned to a sector and while nothing proposed is particularly unexpected (no more coal, no more petrol cars, no more deforestation, etc. ), we like that the group has successfully consolidated a great deal of evidence on this important topic and presented it in an accessible, actionable way.